Today I ran my 3rd marathon. (2 road, 1 trail). 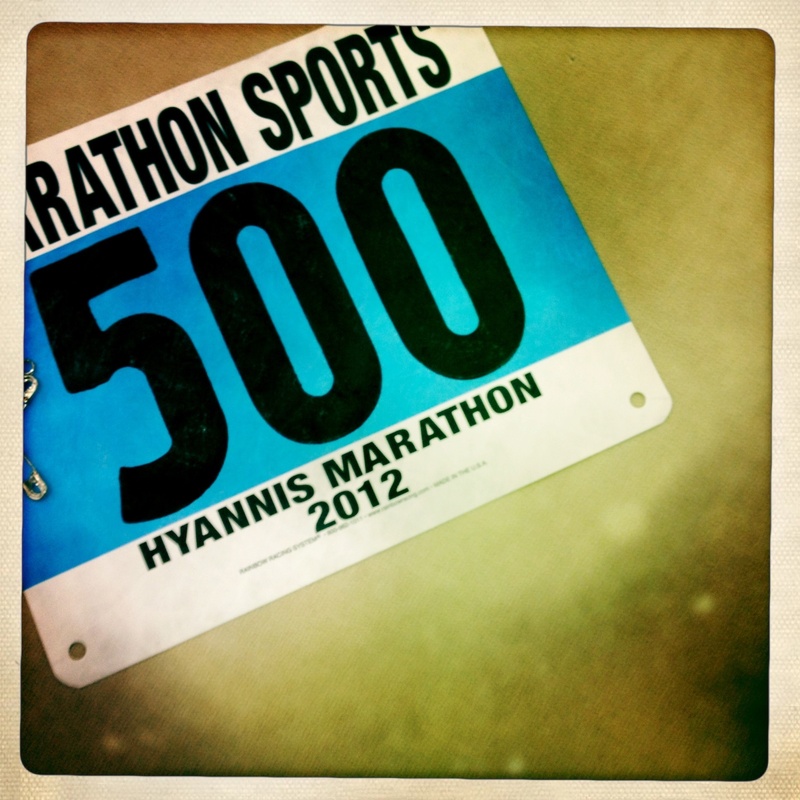 The Hyannis Marathon is a two loop course on rolling roads. Not a lot of total climbing, but some good inclines to keep you honest. The field is made up of about 3500 half marathoners and 500 full marathoners. Last year I ran the half marathon, and had a great time. I was planning on the half again, but then KATYA happened! She egged me on to run the full, and well, I guess I’m easily convinced! Sadly, I never even saw her today! The weather was a bit of a mixed bag. It was warm (for february) getting into the 40’s, but it was EXTREMELY windy. (gusts well into the 30-40mph range!) My plan for this marathon was to treat it like a training run and gain some marathon experience. What I wanted was go at a very comfortable pace for the first 18-20, and then see what I could do for the last 6-8. I finally had the chance to run with Paul! (Dilorenzo) We had almost exactly the same race plan, so we met up beforehand and started the race together. The first half went off pretty much without a hitch. The only issues were normal traffic jams of runners and the wind. As we started nearing the end of the first 13.1, I began noticing some pain in my right pinkie toe. It persisted off and on throughout the rest of the day, but I was able to manage it with some toe wiggling and stride adjustment. The next thing I started noticing, maybe around mile 15ish, was that my quads were beginning to feel sore, which is unlike me. They never became a real problem though. The last issue I had was that the balls of my feet, especially the right foot, started feeling some pain on impact with the road. This was by far the biggest/most lingering issue, but was never really out of control. Somewhere around mile 18, Paul decided to back off a bit and do some walk/jogging. I was feeling ok, so I kept on. I never really hit the wall, but I didn’t really feel able to pick up the pace after mile 20 either. This was mostly due to the pains and soreness I described earlier. I did push in the last mile or so to finish at 3:57:01. I can’t think of too much that I would do differently except for maybe put more perpetuem per bottle (maybe 3 scoops instead of 2) For Boston, I’d like to bring the “easy” pace from 8:55 down to 8:40 for the first 18. CONCLUSION: Great day all in all, especially considering that I was running in brand new shoes in a model I’ve never worn before! Looks like the Trance will be the road shoe for now. Lastly, a big thank you to my friend Jill Duhaime who took on the duty of being my support crew! She was right there waiting for me at the halfway point with my bag in case I needed anything. (All I ended up needing was a fresh bottle of perpetuem.) After the race, she and her friend Ron, who she was there to cheer on in the half marathon, were awesome! They brought me water, carried my stuff, and even got me some chicken noodle soup! Finished off the day with some beer and nachos at British Beer Co. with a few other runners.